On different days, in different Rhode Island towns, Sue Coutu and Anthony Hollins both picked up the phone to the news that their children had died from an overdose. But their shared experience prompted vastly different reactions. Coutu firmly believes in punishing drug dealers and holding them accountable for what she considers their taking advantage of the opioid crisis, while Hollins sees overdoses as a complicated manifestation of educational, mental health, and economic issues that can’t be solved by imprisoning people. With Rhode Island’s recent passage of Kristen’s Law, which gives life sentences to people who sell drugs in cases of fatal overdoses and is named after Coutu’s deceased daughter, their differing solutions are at the center of a heated legislative debate about who is held responsible for the state’s opioid crisis. Hollins’ son, Stephen Hatton, struggled with substance use for most of his life before enrolling in a rehab program in West Palm Beach, Florida. After only 30 days of being clean, he left the rehab center and immediately relapsed. On the night of his release, at 22 years old, Hatton overdosed and died from heroin laced with fentanyl, a synthetic opioid that is often fatal when mixed with heroin. A remarkably similar tragedy unfolded when Coutu’s daughter, Kristen Coutu, started using various drugs as a young adult after being diagnosed with bipolar disorder. At 29 years old, she admitted herself into a Texas rehab center. After only 30 days in the program, her insurance coverage ran out and she was forced to return home to Rhode Island. She hadn’t even been home for 24 hours before she overdosed on pure fentanyl, which she had believed to be heroin. These two deaths came as part of the national opioid epidemic, which claimed 72,000 American lives in 2017 and continues to pose a dire public health crisis. Legislators and medical professionals alike are desperately searching for solutions, and Rhode Island is not alone in its push to pass a bill charging dealers with murder for overdoses—20 other states have similar laws on the books, and more states are considering implementing this legislation. Hollins, who always carries a small framed photo of his deceased son in his bag, advocated against the passage of Kristen’s Law and is very critical of the legislation’s carceral approach. “Of course I want justice for my son,” Hatton told the Independent, “but I don’t want a young kid to go to jail because he doesn’t know what drugs he is selling.” According to Hollins, Kristen’s Law ignores the root cause of overdose deaths. After overdosing himself and barely surviving, Hollins experienced “a huge wake-up call” and has been sober for three years. Hollins characterized the people who would be prosecuted under Kristin’s Law not as dangerous dealers but primarily as drug users who sell heroin to support themselves, often unaware it might contain fentanyl. Prior to Kristen’s Law, Rhode Island policymakers spearheaded a variety of new legislation to prevent future overdoses. In 2015, Governor Gina Raimondo created the Overdose Prevention and Intervention Task Force to reduce overdose deaths by one-third in three years. Raimondo has also encouraged doctors to avoid prescribing opioids and attempted to track opioid prescriptions by entering patients receiving opioids into an electronic database. She has also attempted to increase access to Naloxone, a medication that can reverse the effects of an opioid overdose, by training first responders to use the drug and prescribing it alongside certain opioids. Lastly, Raimondo has made an effort to train doctors and fund centers that provide medication-assisted treatment (MAT), a method of reducing dependency by using counseling and medications, such as methadone. Rhode Island even made MAT accessible to inmates within correctional institutions, a step that reduced prisoners’ post-release overdose rate by 61 percent, but still remains controversial. In many ways, the passage of Kristen’s Law is a break from the policies that Rhode Island has enacted over the past five years, which acknowledge the socioeconomic circumstances that often lead to drug abuse and ultimately prioritize wellness over criminalization. The 2015 Task Force’s Action Plan says, “We cannot arrest our way out of this crisis, but we must build on partnerships with community organizations and law enforcement to reduce demand for heroin and other illicit drugs.” However, solving the opioid crisis through arrests is exactly what Kristen’s Law attempts to do. When Baum was handed Kristen’s case, he made the unusual decision of using the ‘felony murder rule’ to charge Andrade with murder for Kristen’s overdose. This rule states that if an offender kills someone, regardless of their intent, while in the process of committing another felony, they can be charged with murder. The prosecution stated that Andrade killed Kristen while in the process of committing the felony of selling illicit drugs, and thus should be charged with murder. They were successful, and in April 2017, Andrade was sentenced to 40 years in prison for murder—the first time in Rhode Island a drug dealer was charged with murder for an overdose death. Following the success of Kristen’s case, Jim Baum realized that this approach could be a useful tool in prosecuting drug dealers for overdose deaths. But the ‘felony murder rule’ could not be used in every case due to a technicality: namely that people often die from overdoses hours or days after being sold drugs, so prosecutors sometimes struggle to claim that they died while the offender was in the process of selling illicit drugs. Because of this grey area, Baum decided to propose Kristen’s Law, a legal specification that made it much easier for prosecutors to charge drug dealers with murder for fatal overdoses. The heated debate this summer surrounding the law resulted in a few changes to the language of the legislation. One included the addition of an ‘exchange of value’ clause, necessitating that some value be exchanged for the drug in order to ensure that prosecutors were not criminalizing the common sharing of drugs among drug users. In addition, a ‘Good Samaritan’ clause was added, providing legal immunity to those who seek help for overdose victims. Despite these amendments, serious criticisms about the wording of the legislation remain. According to Annajane Yolken, the Executive Director of Protect Families First, a Rhode Island drug policy nonprofit, the ‘Good Samaritan’ clause will still leave people hesitant to seek help, and the ‘exchange of value’ clause is too vague to prevent prosecutors from criminalizing drug sharing. Critics of the law say that depending on prosecutors’ and judges’ discretion to determine which cases fit within the purview of Kristen’s Law and who should receive life imprisonment for selling fatal drugs can also leave room for bias. Coutu asserts that it was obvious that Andrade, who sold Kristen fentanyl, was a “career drug dealer,” but Baum acknowledges that Kristen’s case was unusually simple for a fatal overdose case. In more ambiguous cases, Yolken comments, discrimination could play a significant role in the decision to invoke Kristen’s Law. Kristen’s Law follows a national trend of drug offenders receiving increasingly harsh punishments. 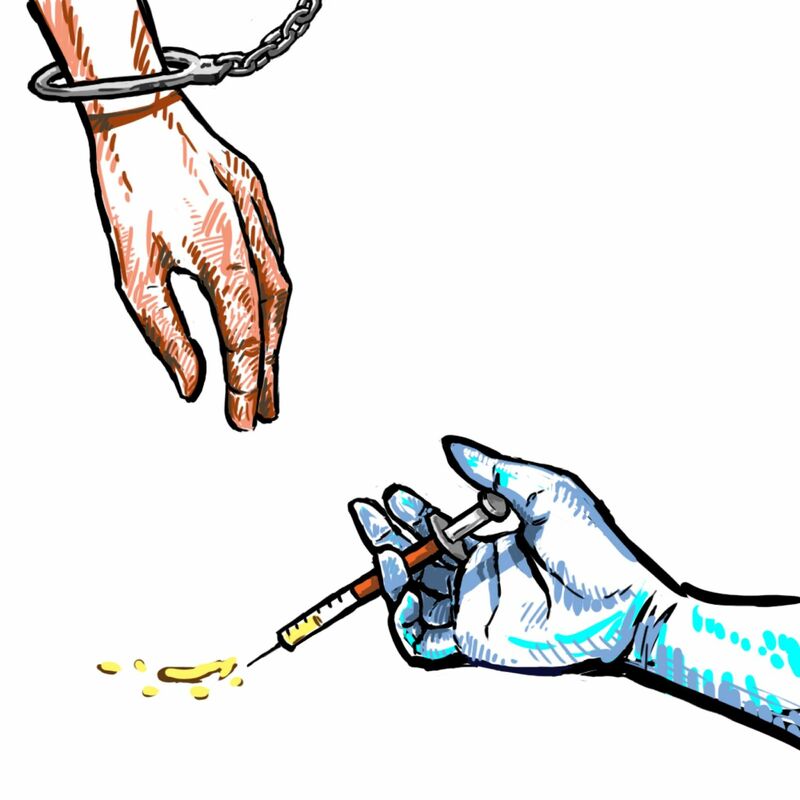 From 1988 to 2012, the average prison sentence for a drug offense throughout the country rose 153 percent, and as of last month, 46 percent of inmates in American prisons were serving time for drug offenses. This increasingly harsh criminalization for drug offenses has targeted minority groups far more than white Americans. Currently, nearly 80 percent of people serving time for drug offenses in federal prisons are Black or Latinx, despite the fact that people of color are not more likely to use or sell drugs than their white counterparts. The history of drug sentencing and enforcement has long been characterized by racism, exemplified by the harsh criminalization of crack cocaine, a drug that is most widely-used among Black Americans, as compared to powder cocaine, which is more common among white Americans. Rhode Island has yet to implement policy interventions that have proven effective at preventing overdoses. Experts have encouraged Governor Raimondo’s administration to institute supervised injection sites, where drug users can use opioids with trained staff on site. Although this model has yet to be officially implemented in the US, safe injection sites have been opened in Europe, Australia, and Canada. Some critics say that these sites would encourage illicit drug use, but RICARES coordinator Arene-Morley said “There is no evidence that giving a safe place for consumption of illicit substances increases consumption over time.” Governor Raimondo has said that she will explore the possibility of these sites, but President Trump’s administration has threatened to prosecute these sites as violating federal law. According to Hollins, another step to reducing the rate of overdoses would be to increase the use of fentanyl strips, which are a convenient and fast way to test if drugs contain fentanyl. “These little strips can save your life,” Hollins said. The strips have become more widespread since they were legalized in Rhode Island in June, but Hollins said that they should be more accessible. “Sometimes I ask myself, is it worth it to keep fighting?” Hollins said. But despite occasional doubts caused by setbacks like the passage of Kristen’s Law, he is confident that his advocacy works toward fostering a sense of connectedness among people with experience of substance abuse that Arene-Morley argues is so important. Not only can this community cultivate a supportive space, it also can provide a key educational resource for people to learn from one another. Solutions like safe injection sites and community building have not been implemented because they don’t seem to satisfy the emotional pleas of some people who have been impacted by the crisis. In the testimonies and media coverage surrounding Kristen’s Law, there is a sharp dichotomy between the emotional rhetoric used to support it compared to the evidenced-based arguments used to criticize it. As Fine said, “This is an emotional thing, because anyone who has lost someone wants to prevent more losses from happening.” It makes complete sense for grieving parents, like Sue Coutu, to want retribution for their children’s untimely deaths, and hearing stories like Kristen’s, it is difficult not to demand immediate action. But Fine warns that the emotional appeal of Kristen’s Law may obscure a more nuanced portrait of Rhode Island’s drug crisis. KATRINA NORTHROP B’19 doesn’t think we can arrest ourselves out of a crisis.